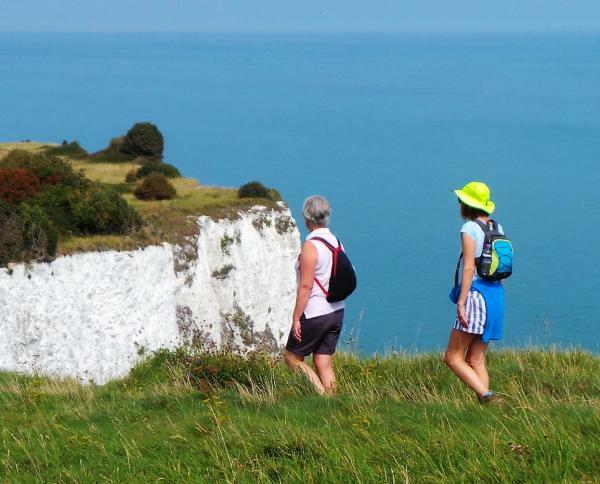 Planning is well under way for this year's White Cliffs Walking Festival and last week the organising team issued a media release anticipating the pleasures in store for those who take part. The full release is available here. 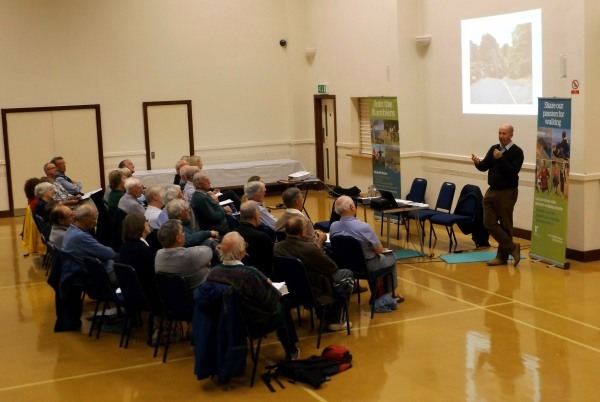 The annual workshop for all those interested in footpath matters in Kent will be held on 3 May 2019, as usual in Lenham Community Centre. All are welcome – you don't need to be a current volunteer although we will be delighted if the meeting inspires you to offer your time to help protect the county's paths. Advance booking is essential: there are more details here. 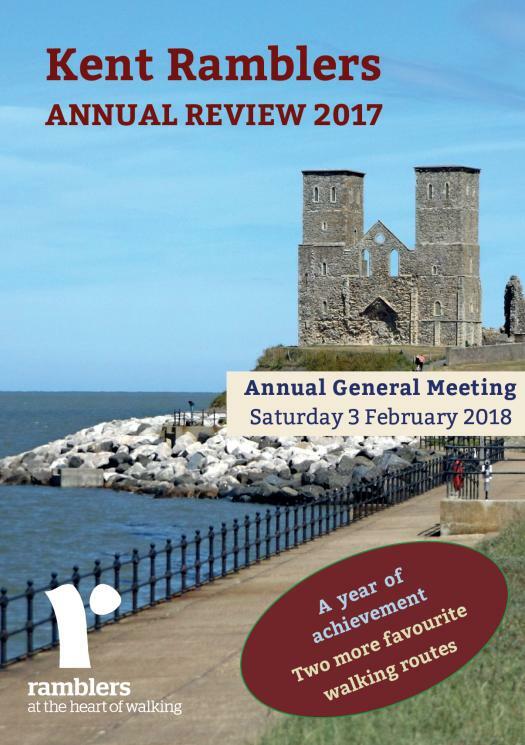 The 2018 Kent Ramblers Annual Review has been published and posted to all our members. If you are a member and have not received your copy then please get in touch at info@kentramblers.org.uk. The project's first winter walk for carers and those they care for took place in Margate. Les Preston from White Cliffs Group was there to help and sent these photographs. For more information on Carers' Walks, click here. The Stepping Out project which offers carers and those they care for the opportunity to walk, socialise and lunch with volunteers from the Ramblers has marked the completion of a second successful year with the released of a new video. 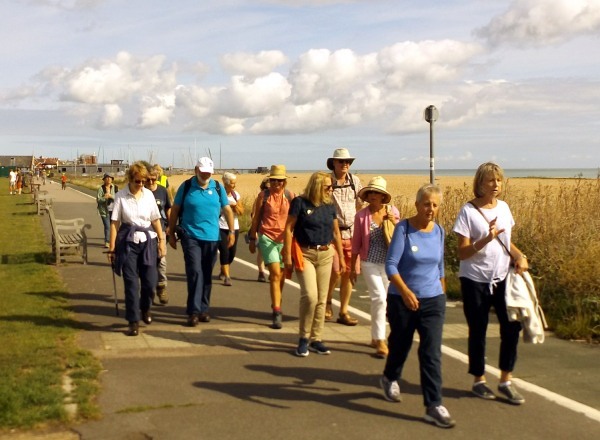 Pioneered in Kent by Sue Mott with the vital support of Ramblers in Kent, especially those from our White Cliffs Group, Stepping Out widened its geographical coverage this year with events in Manchester, Doncaster and Hertfordshire. Stepping Out is supported financially by Sport England. View the video here. 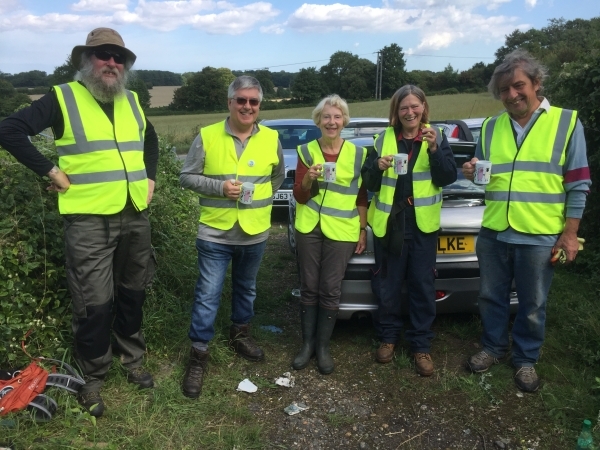 For the sixth consecutive year volunteers from White Cliffs Ramblers organised a very successful walking festival during the week of the August Bank Holiday. They have now evaluated the event and produced a comprehensive report showing that despite rain on two days the total number of walkers was 1201, only a slight fall compared with the record 1252 of the preceding year. The full report can be read here. The book follows the style of our successful Guide to the Kent Coast Path: Part 1 with specially created 1:25,000 maps, photographs and diagrams in full colour throughout. The previous guides to these walks produced by Kent County Council have been out of print for many years. 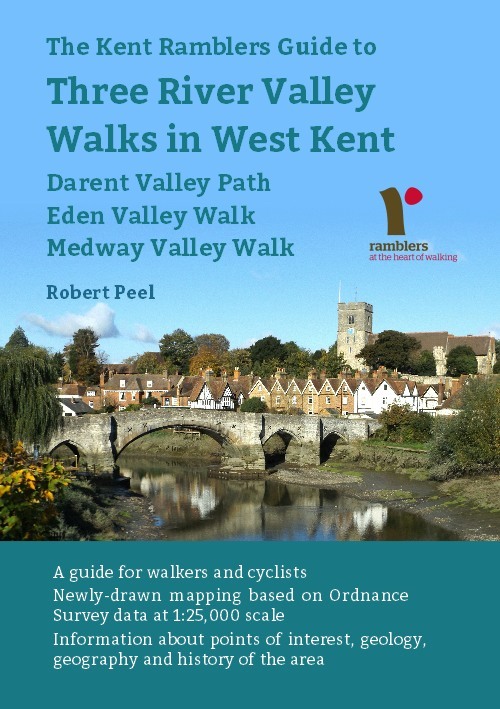 Now all three walks are covered in one book, available from our publications page or from good bookshops online or in the high street. To coincide with the 40th anniversary of the opening of the North Downs Way, a week of celebrations will take place from 24-30 September 2018: "a fun week of music, drama, literature, medieval feasting, beer festival, and more walks than you could shake a pilgrim stick at". More details here. 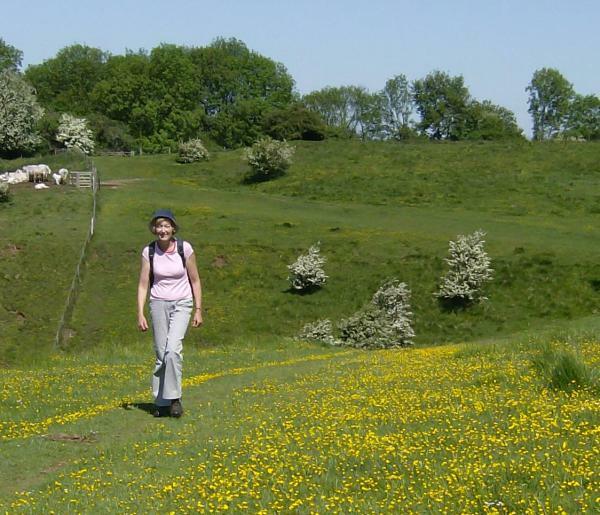 The photograph shows the North Downs way near the Devil's Kneading Trough. The sports minister Tracey Crouch met carers from the Stepping Out project at Aylesford Priory in July to give her backing to the series of walks, founded by Kent Ramblers and East Kent Carer Support organisations, to improve the lives of carers and the people they care for. “It’s a great scheme combining physical activity with respite and connectivity and much loved by participants,” she said as she joined the group for a walk round the grounds of the Priory. The walks, supported by the National Lottery through Sport England, the Ramblers and carers support organisations, proved such a success in Kent last year, they are now being trialled in Doncaster Manchester and Hertfordshire alongside the Ramblers groups in those areas. Our 2018 programme of walks for carers and those they care for continued with a well-attended event at Goodnestone Park Gardens near Canterbury. Read more here. We are pleased to report that Sport England has awarded sufficient funding for the Stepping Out project to support not only the full 2018 programme of walks in Kent but also walks in Manchester, Doncaster and Hertfordshire. 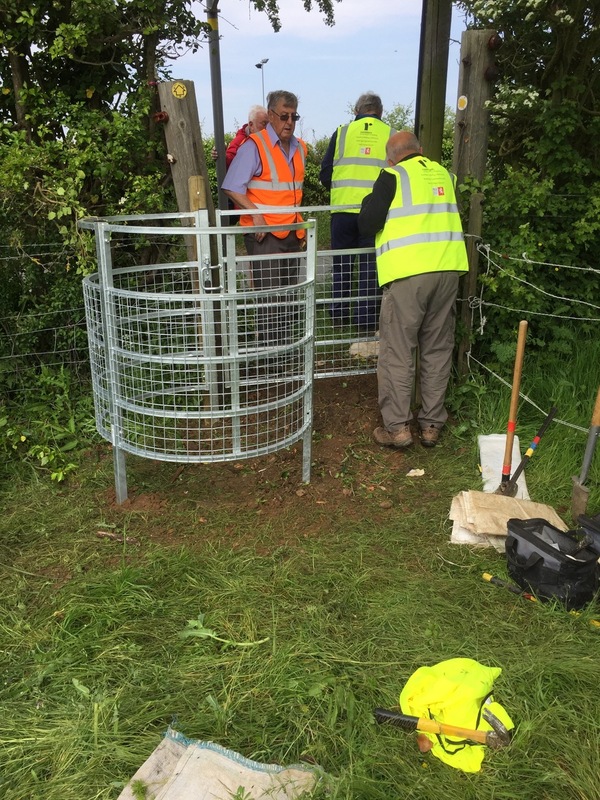 The photograph shows the team putting the finishing touches to a new gate in place of a rickety old stile. Ramblers volunteers regularly give up some of their spare time to improve the paths for everyone. Please join us to support their work – or even step forward to become one of them. The BBC Radio Kent Breakfast Show (on Friday 6th April) featured the “Stepping Out” Carers’ Walks on a segment about carers and their immense value to society. 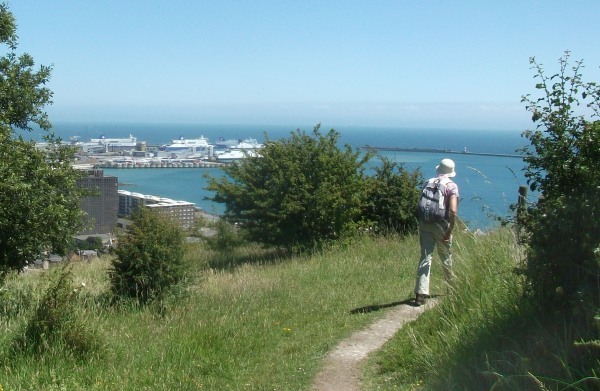 One of the walks organisers, Sue Mott, explained that the project evolved from the “wonderful White Cliffs Walking Festival” when it became evident that carers were the crucial link to offering outdoor activity to people with a disability. Following its success in Kent, The Stepping Out project – subject to funding by Sport England – may now be piloted in other areas of the country including Manchester, Doncaster and Hertfordshire. The photograph shows the walk at Hythe in March 2018. For more details about the project, click here. 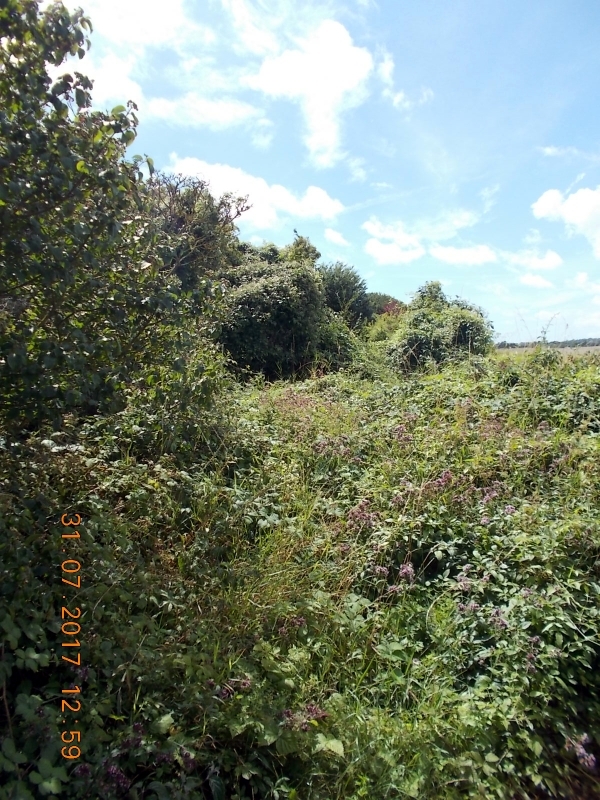 Today we learned that following a public inquiry in January the appointed Inspector has confirmed changes to the public rights of way along Faversham Creek made by Kent County Council with the support of Kent Ramblers. 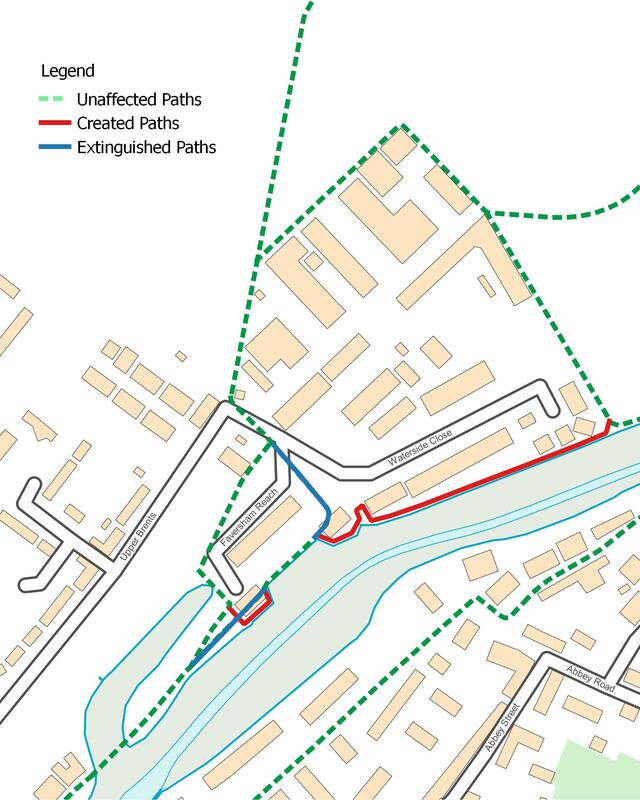 The result is that an unusable footpath that was built across some years ago has been removed from the definitive map and a much more useful path along the edge of the creek has been added. 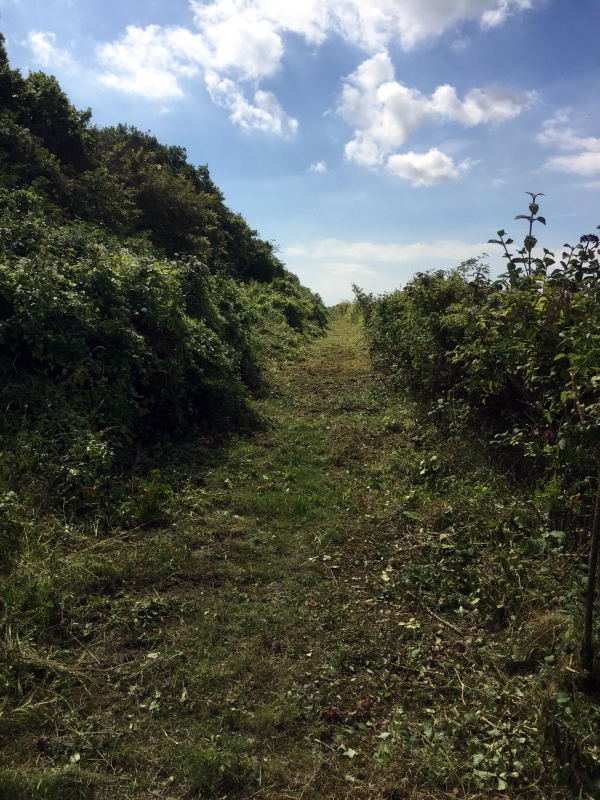 The new path offers fine views along the creek and we hope that the proposed route of the England Coast Path will be modified to follow it. Kent Ramblers' Coastal Access Officer, Ian Wild, spoke at the inquiry on behalf of the Ramblers and later said "It has been a long time coming. An unbroken path along the west bank of Faversham Creek will hugely benefit the town and all walkers.". 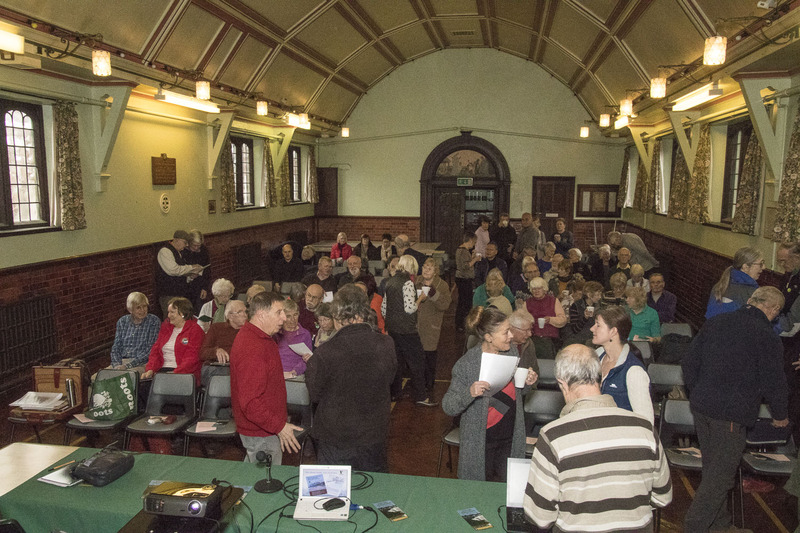 Around 100 members turned up for our AGM in Littlebourne, kindly hosted by our Canterbury Group. As well as the usual formalities of receiving accounts and report and electing officers (which we kept as short as possible) we had a series of presentations that illustrated the variety of work being done for walkers by our dedicated volunteers. We celebrated the work of our Local Footpath Officers and Parish Footpath Observers - but we also noted that we don't have Kent completely covered and we appealed for more people to step forward to help with this vital work. We looked forward to the opening of the section of the England Coast Path from Ramsgate to Whitstable during 2018 and to the opening of the rest of the route in Kent from Whitstable to Woolwich in 2019. We watched a video of a walk from the 2017 programme of walks for carers and those they care for and looked forward to continuing this valuable work in 2018, subject to renewed funding from Sport England. After an open forum we enjoyed a ploughman's lunch and the more intrepid the braved the none too hospitable elements for a walk through the very fine surrounding countryside. There are more pictures of the event here. The Kent Ramblers 2017 Annual Review has been posted and has started landing on members' doormats. Already half a dozen members have submitted their entries for this year's competition to win some Paramo clothing or copies of our Coast Path guide. As usual, the Review contains news from the Groups, topical articles and descriptions of two of our favourite walks. If you are a member and you haven't received your copy of the Annual Review please let us know at info@kentramblers.org.uk. The 2018 AGM will be hosted by the Canterbury Group on 3 February 2018 at Littlebourne. There is more information here, where you will also find a link to the minutes of the 2017 AGM held in Kemsing (pictured). Please note that printed copies of the draft minutes will not be available at the AGM. Bromley Ramblers held another very successful Christmas five mile walk on 20th December, with Father Christmas and one of his ‘little helpers’ providing half-way mulled wine, coffee and mince pies for 40 members. Everyone then joined a further 30 people for a most enjoyable lunch at Farleigh Court Golf Club. All that was missing was the snow! There is increasing evidence that volunteering is beneficial to the health and well-being of those who take part – it is a great way to make friends, acquire new skills and have the satisfaction of doing something useful for the community. One of the most important areas of work for which we need volunteers is the protection of footpaths. Our aim is to have someone in every parish (or equivalent urban area) who walks the paths regularly (at least once a year) and reports any problems – these are our Parish Footpath Observers. 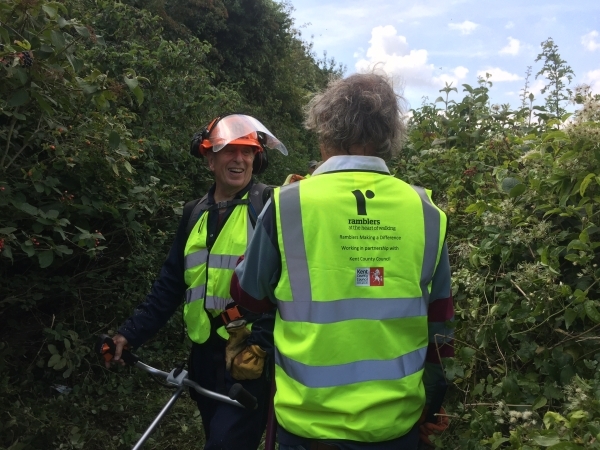 We also need volunteers – Local Footpath Officers – to help deal with occasional less straightforward issues reported by the Observers, to check all proposals submitted to Kent County Council for extinguishment or diversion of rights of way and to inspect certain planning applications to ensure the best outcome for walkers. Local Footpath Officers normally cover several parishes but we are happy to be flexible about that. No particular experience is required as we offer training and support to all our volunteers. Details of the parishes for which we need cover including links to maps showing their locations can be found on our Vacancies page. Contact information for getting in touch are on that page – we are very happy to discuss these roles without any commitment on your part. We are also in need of a Sector Coordinator and an Area Footpath Officer but these roles are more suited to people with some experience of rights of way work. If you are interested in either of these, please get in touch – if only to discuss what might be involved. The last of this season's walks for carers and those they care for was held in glorious autumn weather, starting at Aylesford Priory. One of the walks explored the historic town including the church and the medieval arched bridge, recognised by Historic England as a good example of its type. Read more details about the Aylesford walk here and about the Stepping Out project generally here. 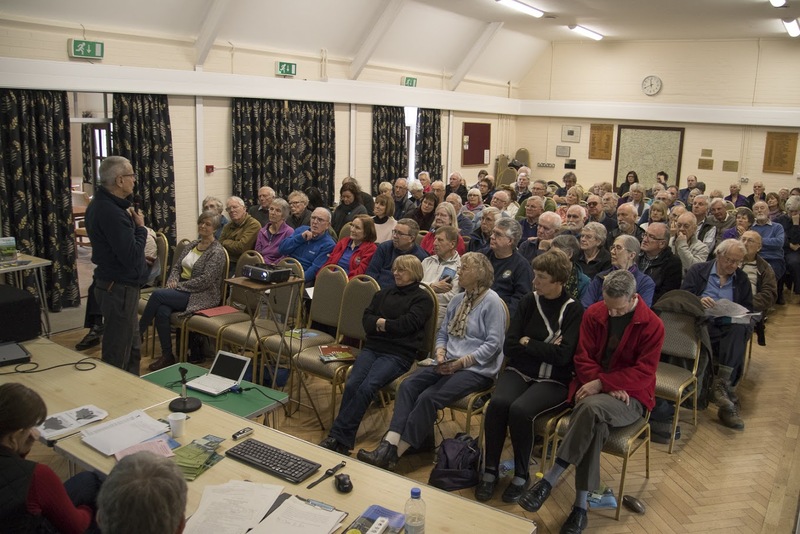 At the request of the team that delivered this year's White Cliffs Walking Festival, John Grace has produced a comprehensive report assessing the Festival's success in meeting its objectives. The total numbers of participants on all the 43 walks was a record 1252 and the variety of interesting themes was much appreciated. The report explains the planning, promotion and delivery of the Festival programme and analyses the data collected, particularly as to where the many participants came from. You can read the full report here. 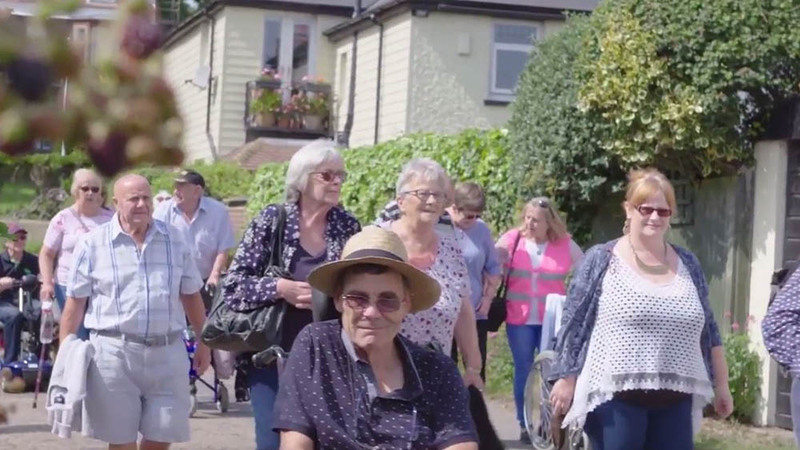 Today Sport England released a film made during the Carers' walk that took place in Kingsdown and Deal as part of the White Cliffs Walking Festival. 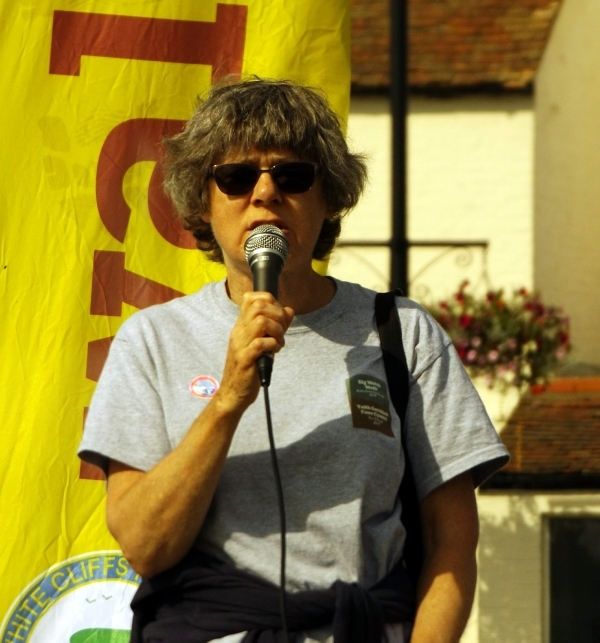 The walk was one of eight being organised this year as part of the Stepping Out project, a joint venture between Kent Ramblers and Carers' Support organisations, funded by Sport England. You can read more about the 2017 Stepping Out programme here. Visit the Sport England web site and view the film here. Details of the next and final event of the season are here. The last Wednesday in September, the date of the East Kent Ploughing Match, seems to enjoy more than its fair share of fine weather and this year was no exception. The sun shone, the sky was a somewhat hazy blue and, most importantly from our point of view, there was no wind to blow our tent or our leaflets away. The event is held at a different location every year and this time it was at Quex Park, not too far from Margate. Volunteers from White Cliffs Group manned the Ramblers’ stall and chatted to visitors about the joys of walking in Kent. 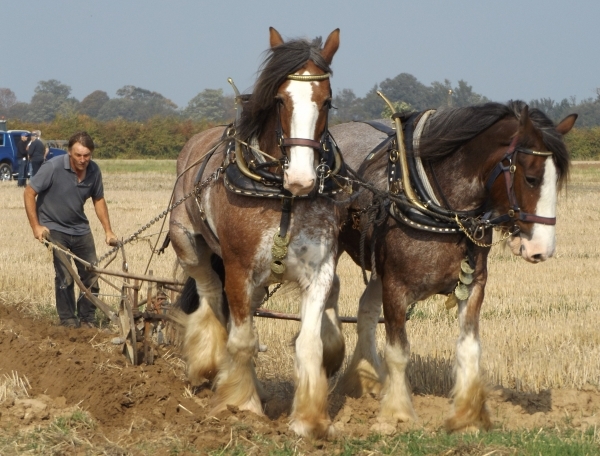 Quite apart from the competitive ploughing, the event is a major agricultural show with plenty to see including demonstrations by birds of prey and the regular sheaf tossing competition. Nevertheless, the heavy horses and vintage tractors are not to be missed, especially regular attendees Madge and Dolly (pictured). A great day out – do join us next year. Most of us take for granted the simple pleasures in life such as going for a walk. But, for many people with caring responsibilities, going for a walk to enjoy the physical exercise, the company of fellow walkers and the delights of the Kent countryside is something they can only dream about. This summer Kent Ramblers and carers' support organisations in East Kent are running a project funded by Sport England to enable carers and some of those they care for to take a much needed break and go for a walk in the company of members of the Ramblers. The sixth of the series of walks took place as part of the White Cliffs Walking Festival on 25 August when around 50 people participated. They were joined by Vanessa Griffiths, Chief Executive of the Ramblers, and a film crew from Sport England. There is a full report on the day here. For more information about the project generally, click here. The opening ceremony of this year's White Cliffs Walking Festival took place today. 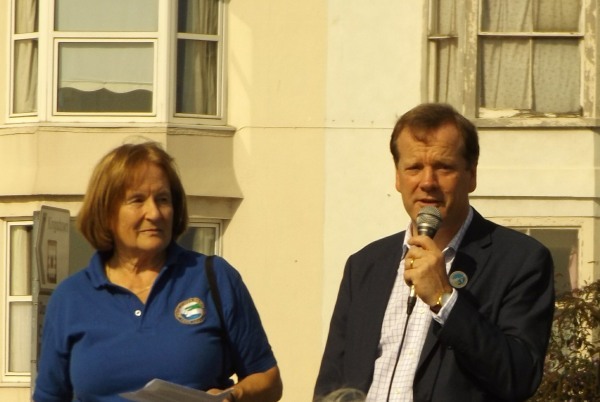 Brief speeches were given by Margaret Lubbock (Chairman of White Cliffs Group), Charlie Elphicke (MP for Dover), Kate Ashbrook (Vice Chair of the Ramblers' Board of Trustees) and Councillor Nick Tomaszewski (Deputy Mayor of Deal). The Festival runs until 30 August – to peruse the programme and book a place on a walk please visit the Festival web site. As usual there is a huge variety of walks, many of them with themes reflecting the rich history of the area.